The Pink Glass Swan tacked to the wall. “ …the trip from oil on canvas to ideas on Xerox was, in retrospect, yet another instance of “downward mobility” or middle-class guilt “. 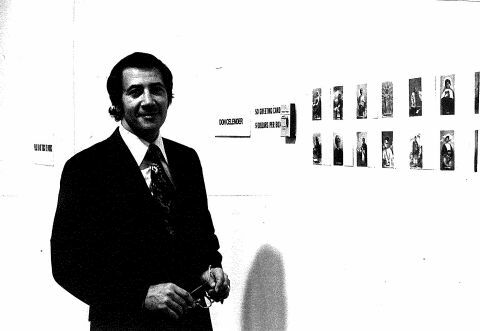 The American artist Don Celender was perhaps unaware of this back in 1970s New York when he partook in the drive towards the radical redefinition of the art object with his first questionnaire mail outs. 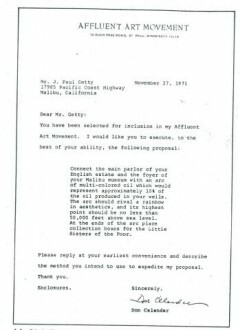 Lucy Lippard meticulously charted this migration towards a more fluid, socially and politically responsive way of thinking about art in her own survey work ‘Six Years’ in 1973. Many artists, including Celender, started to think about art in terms of systems that would function as analogues for lived experience. Celender’s solo show Surveyed at the Arnolfini in Bristol, presents a comprehensive paper trail of his correspondence-led practice. Celender’s early venture into conceptual art both reflected and spoofed a common desire amongst artists of that time to focus on problems of organization and engage in systems theory. In the socio-political environment of technological advancement and the application of cybernetic theory to everyday life Celender sent his pseudo-official surveys out to specific demographic groups to probe the depths of human consciousness. He maintained this artistic strategy throughout his career, producing a compelling account of society through written response. His provocative questions focused on art, life, death, personal history and his obtusely absurdist artistic proposals aimed at large corporations. Celender targeted and antagonized a wide cross-section of American society in a performance of data trawling to fulfill ‘The fisherman’s joy of throwing out the line and having something bite’. Surveyed is the first of two UK based shows of Don Celender’s ‘Conceptual documentation’ and is the first time his survey projects have been presented in Europe. Celender’s prolific career spanned from the 1970s to his death in 2005, but his work has rarely been seen outside his native America and the numerous surveys he produced remain largely unpublished.The exhibition presents the changing face of American society as it morphs through time and space along the gallery walls. Celender’s process of demographic selection is as interesting as the responses and Surveyed presents us with target groups including curators and the ranks of the artworld, the military, restauranteurs, high society New York and CEO’s of industrial companies. 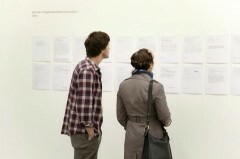 Staying true to the preferred mode of display of the artist, the curator Sacha Waldron has simply tacked the paper correspondence and completed surveys to the white gallery walls at eye level – eliciting the feeling from the viewer that they are reading an unpaid water bill stuck to the fridge door. The consistency of the survey format and the purity of the line of questioning places the viewer in an uncomfortable position of navigating the delicate subject of taste as a strange sense of judgment begins to take a grip as you progress through the show. On entering the gallery I am faced with a seemingly endless stream of material to navigate through as the A4 sheets of paper snake around the walls. However, once I start to engage with the work I am hooked and voyeurism takes the lead. The first piece I encounter is the 2001 Artists, Curators & Museum Directors Artist Preference Survey which asks: ‘In your view, which artist from any period has been most sorely ignored or neglected?’ The responses reveal the nooks and crannies and political intrigue of the disgruntled, haven’t-quite-made-it art world. Here a psycho-analyst’s field day of narcissistic ego, heroic displays of erudition, pious generalizations and counter-transfernce pours forth from the white paper walls. Some replies are scrawled cursive writing, emoting through the sprawling y’s and s’s, others neatly typed, presumably to add an air of officialdom to their bemoaning of overlooked friends. I become a pseudo-detective, linking names with names, associations with power players and forming the trite circle of the early noughties art world in my head. However, if you are not teetering on the borders of that demographic yourself would the work mean anything – or is that the point? Is the joke on you for spending so much time with the piece? This slight jarring is leveled by the universal appeal of the macabre. A true crowd pleaser, Immortality Study No. 1, 1989 spills along the middle of the gallery and sneaks around the wall, drawing the visitor into the depths of the exhibition. Short and sharp in response, the imaginary epitaphs read like an eerie blog thread. Taking the viewer on a rollercoaster ride from poignant contemplation to wry humour (Vincent Price : “I’ll be back”) to audacious self-promotion, this survey work demands more from the viewer with less to read. The silence and brevity created in the sparse images before us pierces our own interior landscape and we are compelled to pause and mentally fill in the survey ourselves. “ Yet the Van Gogh reproduction or the pink glass swan—the same beautiful objects that may be “below” a middle-class woman (because she has, in moving upward, acquired upper-class taste, or would like to think she has)–may be “above” or inaccessible to a welfare mother. The phrase “to dictate taste” has its own political connotations”. This exhibition provides the viewer with both a picture of the cross-section of society under observation in Celender’s survey petri dish and a mirrored panorama of the audience themselves. In grappling with the age old question of class and taste is Celender’s hunter-gatherer curiosity and social outreach more revealing of his own inner landscape rather than those he surveys at a distance? Rachel Falconer is a curator and producer based in London.